This is a great winter salad from Healthy Living. With the warm toasted pecans on top and the maple syrup, it is so heartwarming that it goes on the Hygge list. Pair it with a hot bowl of soup like Minestrone, or Sweet Potato and Apple and you have the perfect meal for a cold winter day. Serves 4 side dishes and 2 large salads as a meal. In a large frying pan, over high heat, toast the pecans. This is so easy and doesn’t take long. Just continue to shake the pecans in the heated pan until the pecans started to turn a golden brown, approximately 3-minutes. Watch them carefully to ensure they don’t burn. In a large bowl, toss spinach with 2 tablespoons of dressing. Divide spinach on each plate. 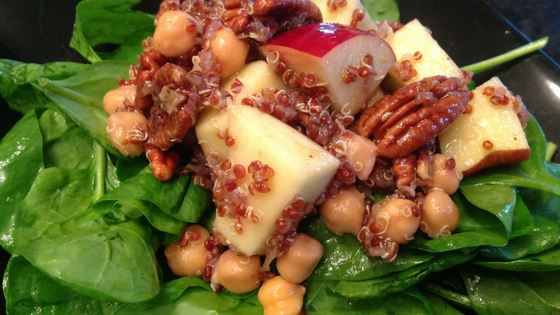 In the same bowl that you tossed the spinach in, add the pecans, apples, quinoa, and chickpeas. Toss 1-2 tablespoons of dressing and add to plated spinach. Drizzle with additional dressing as required by your taste buds.